Guys, lemme let you in on a little secret. 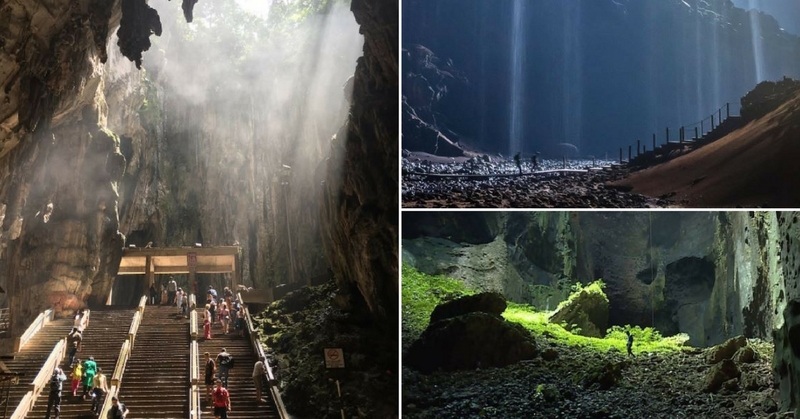 Malaysia has a lot of offer when it comes to food and culture (of course), but did you know that the world largest cave chamber is actually one of our own?! Curious to know which one is it? Read on to find out more! A fair word of caution, Gua Gomantong is perhaps reserved for those edging for an adventure. Come prepared and expect nothing less from creepy crawlies, the occasional cockroach appearance (yes! ), and not to mention, bat poo slathering the moist walls. If you’re curious on experiencing a cave’s ecosystem firsthand, this place is probably one of the more authentic spots you can venture in. Doubling up as a religious site for the Hindus, Batu Caves is indeed a glorious attraction by its own. Enter the grounds and you’ll be greeted by a breathtakingly magnificent statue of Lord Murugan, bathed in a regal hue of stunning gold. A word of advice: Watch out for those pesky monkeys – they have been known to swoop on unsuspecting visitors, snatching anything from small items to food. If the pictures don’t impress you, then perhaps you’d be by the fact that Gua Nasib Bagus is recognized as the world’s largest cave chamber in the WORLD. The interior is so massive that it’s rumoured to be able to fit 40 units of Boeing 747, without overlapping the wings! Due to the passage being filled with water most of the time, visitors are required to wear appropriate clothing and be equipped with proper equipment before venturing in further. Home to 3 million bats, the Deer Cave also holds the fort to the sighting of ‘Abraham Lincoln’ and the mystical Garden of Eden. Visitors will be guided to a specific spot where one may witness the profile of Abraham Lincoln being formed by some very strategic limestone placement, while the gorgeous Garden of Eden is cultured from a stream of sunlight that allows for the growth of rich vegetation. Cap the visit with a jaw-dropping sight of bats emerging from the caves in search for food, a swirling torrent of wings taking flight in the evening sky. A hidden gem located about 33km north of Kangar, Gua Kelam is essentially a cave in the midst of the lush forestry. Visitations are made easy via a wooden suspension bridge that links the entrance to the end, so senior citizens will also be able to enjoy a laidback stroll among stalactites and stalagmites. A gushing river runs through the cave, and out to a Secret Garden that makes a perfect picnic spot for families.